Yellow….A Happy & Optimistic Color, or is it? You are here: Home / Color / Yellow….A Happy & Optimistic Color, or is it? Forsythia and daffodils, dandelions and daisy’s. Baby chicks. The glow of the sun. Warmth, brightness and optimism and cheer. This is how we usually think of the color yellow. Although we most often think of yellow as pulsating with life as in the examples above, yellow also has polar opposite qualities we may prefer to ignore. In animal life it sends a mixed message, especially when combined with black – a warning – think bees. In humans, our decline may be noticed by the jaundiced skin of illness, and in nature, despite the beauty, the yellow leaves signify death. In history, interestingly enough, it was often a color of power. In ancient times the Chinese emperors were the only ones allowed to wear the yellow colored garment. 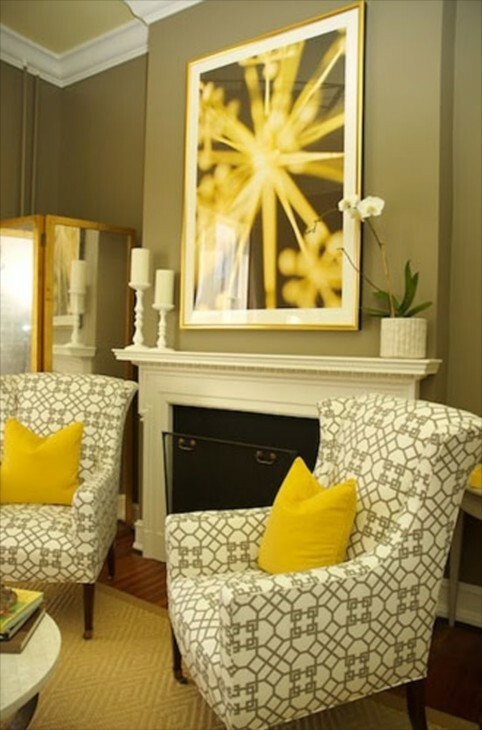 Yellow can be soft, subtle or bold, muted, sunny or fiery, creamy, relaxing or invigorating. Yellow can either be the star, the diva in a room or a supporting actor or offer only a tiny walk on role. In psychology we again see opposites in that the color yellow, although most often associated with the mind and intellect as well as optimism, it also suggests impatience and cowardice….thus the expression yellowed bellied coward. Yet yellow is the best color to create enthusiasm for life. think about how good it feels to emerge from day after day of gray days to the warmth of the sun on our face. Isn’t that why many of us want to head to the beach in winter? Yet it can also be anxiety producing, vibrating too fast in it’s brightness or saturation, despite the fact that it can also assist with clarity of thought and ideas. Yellow is also the most visible of all colors which is why it is used in caution signs and traffic lights. Picking a yellow paint or fabric, or to use in combination with another color(s) can sometimes offer challenges as to how much and where to use it. Let’s look at some examples of yellow decor. 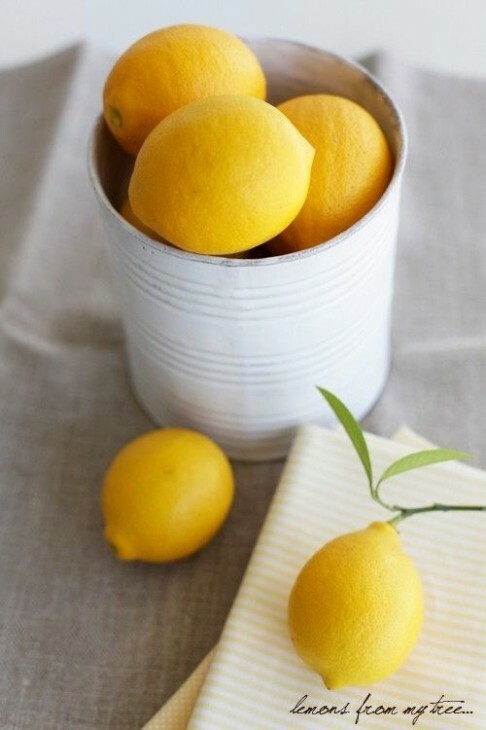 So let’s consider yellow in it’s varying intensity…….these examples will allow you to see how the deepness or lack of it affects your like or dislike of each hue. The same intense yellow softened by a large dose of neutrals. Here it provides the pop of color, and quite effectively. Here is a much softer yellow. Being able to effectively carry off yellow depends on large part what your skin color/undertones might be. The same holds true when picking a particular yellow for a room with lots of other color going on, say in furniture or textiles. Here we see a light yellow with the addition of some bling. Do you look at the color more favorably because of the accent colors added? Now lets look at some rooms and see how the depth or intensity of color and or color combinations affects your overall impression of the room. 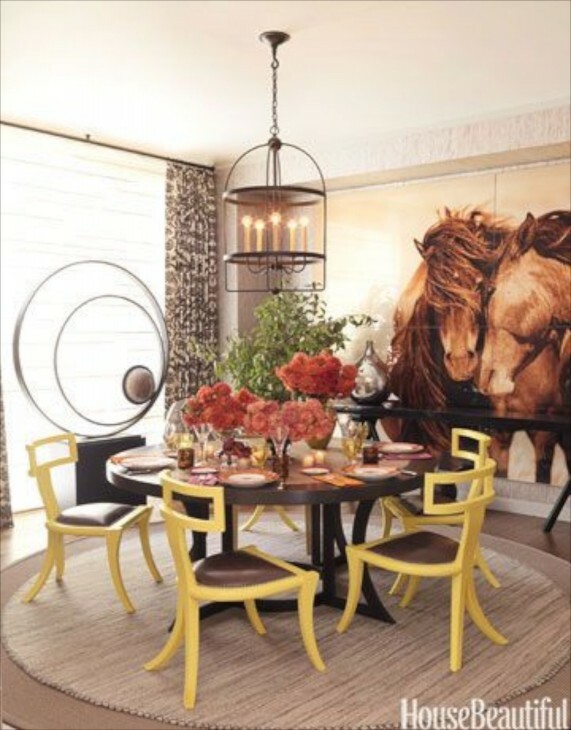 In this dining room we have yellow combined with gray. There are three elements at work here…..one is the that both drapes and rug have geometric patterns, two the light and the chairs are see through. The ghost side chairs and chandelier contribute to the light and airy feeling in this room. Wood chairs or a heavier light fixture would have left an entirely different impression. 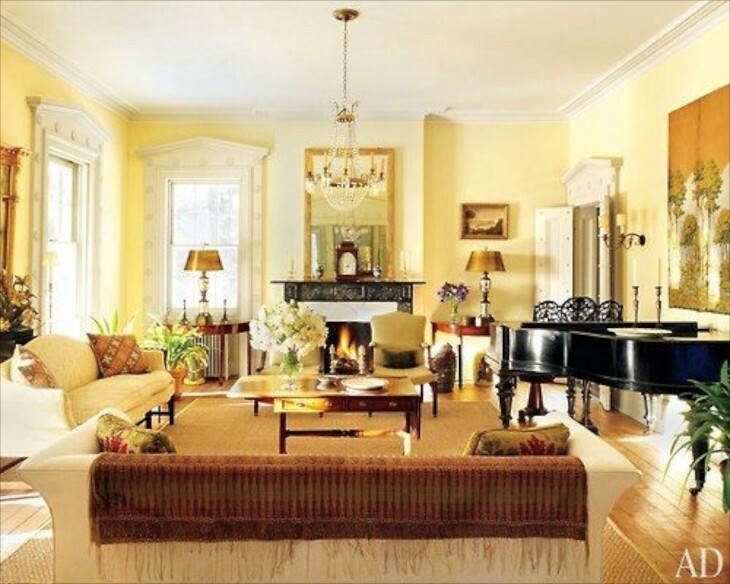 Monochromatic yellow coloring in this large living room. Lots of windows add to the light feeling. The green of the trees outside add an accent color and keep the room from being boring. Here the yellow is on the ceiling and the rug instead of on the walls. 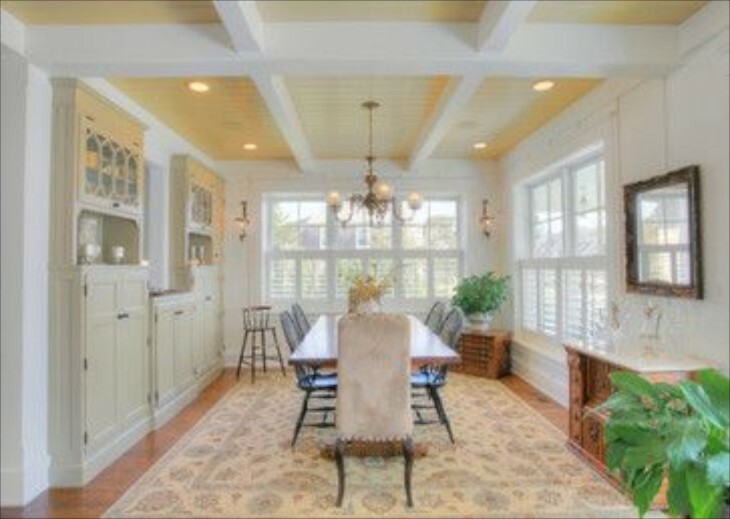 The white beams and bead board on the ceiling add much architectural interest. Yellow paired with gray. 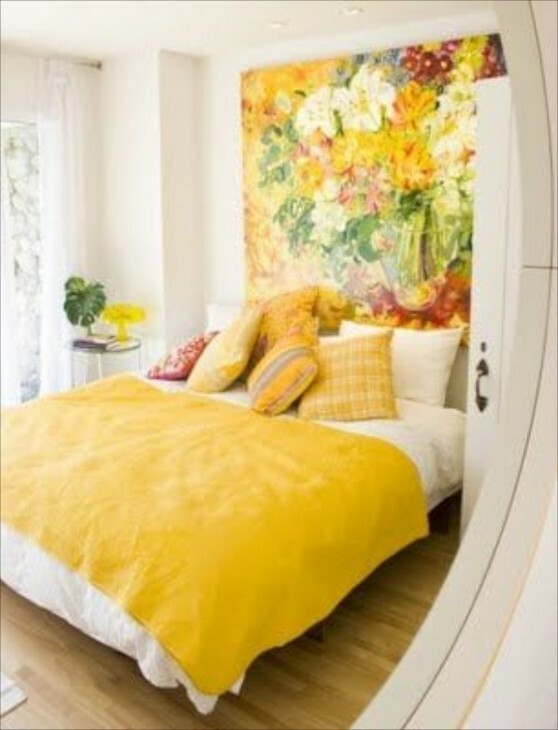 The choice of occasional use of a darker yellow than the walls in the framed photo mats is brilliant, and makes this modern decor sunny and welcoming. In this room, just a couple of pillows, a ginger jar and flowers add a sunniness to what would otherwise be a monochromatic room. This room illustrates how just a couple of accents can completely alter a room. 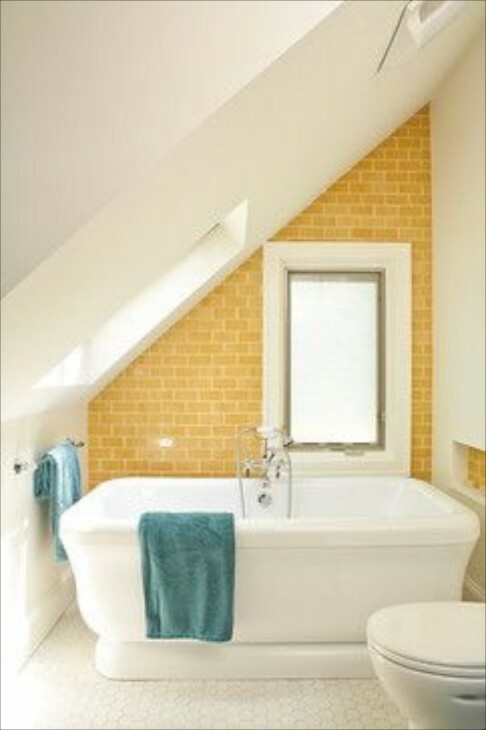 A single accent wall of a golden yellow adds a bright spot to this white bathroom. The blue towels are a wonderful choice. You could also use red, black, navy and a few other towel choices as well. AN intense yellow that would force you to wake up in the morning! This is an example of an energetic yellow…….it literally moves your eyes. A deep yellow, but not as intense as above. The cabinet and metal fixture finish choices add elegance and softness. 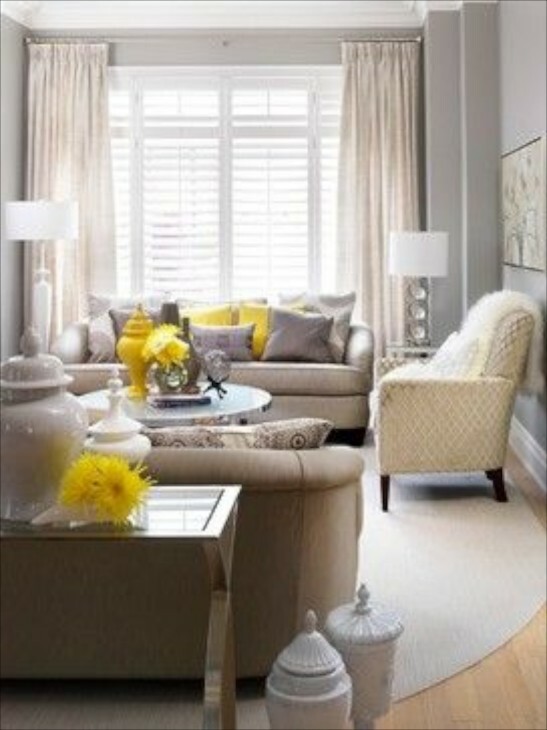 Here a muted yellow and white allows for more emphasis on the contrast between the yellow and the white. More subtle contrast here than we saw above. 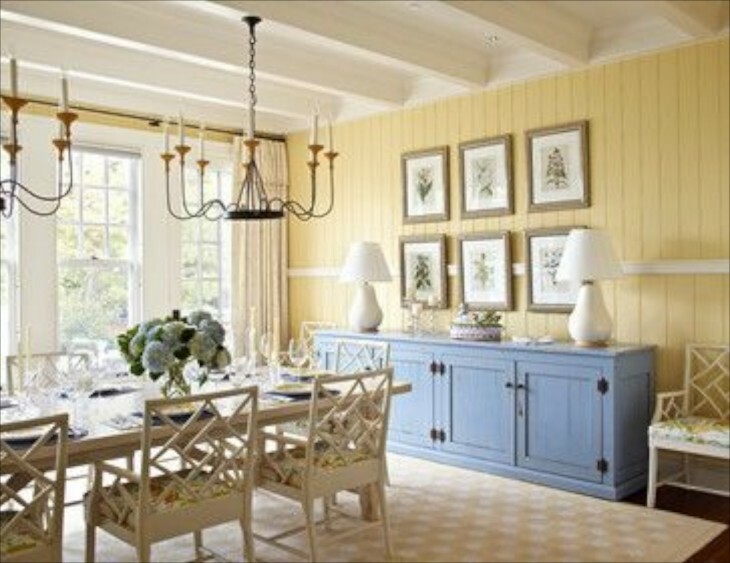 Such a pretty choice of a yellow for complimenting the blue painted piece of furniture. Warm and inviting. The choice of a patterned quilt and pillows adds needed texture and pattern. 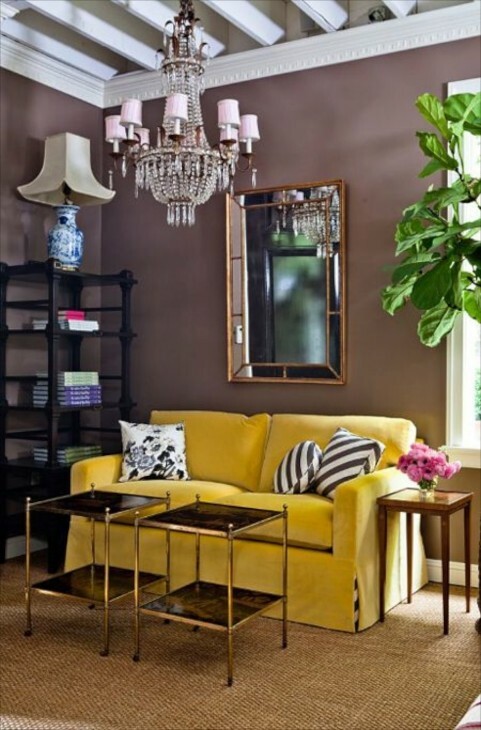 This room takes yellow to a sophisticated level. 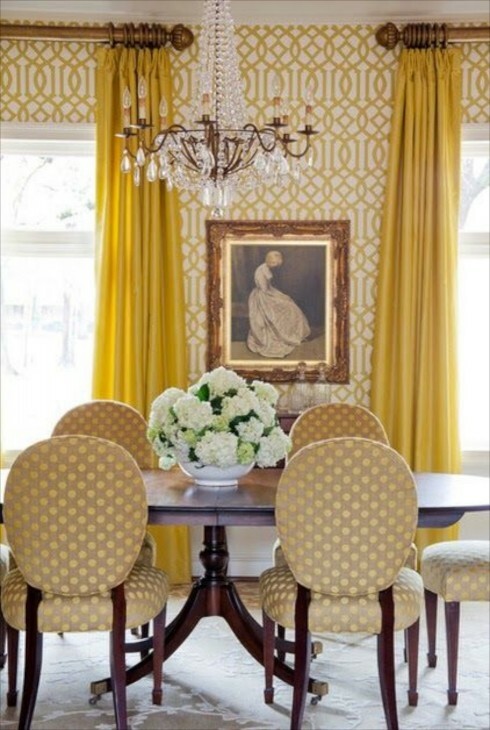 Using geometric pattern and multiple shades of yellow gold, the room is interesting from top to bottom. Notice that the rug also is patterned. It takes a terrific eye to put together a room like this. The painting on the wall also hangs in my bedroom. Modern and classy. 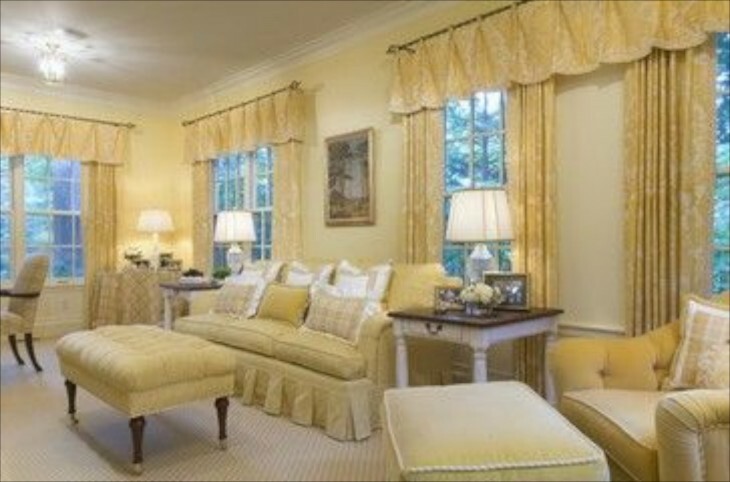 If you study this room a bit, you will see another example of using very little yellow for big impact. This room is mostly white (floor, most of the walls, ceiling, couch) but the room reads as yellow. That is the impact this color can have. The sage green walls are a perfect foil for the large yellow artwork. The pillows bridge the furniture to the art, the art to the yellow ceiling. 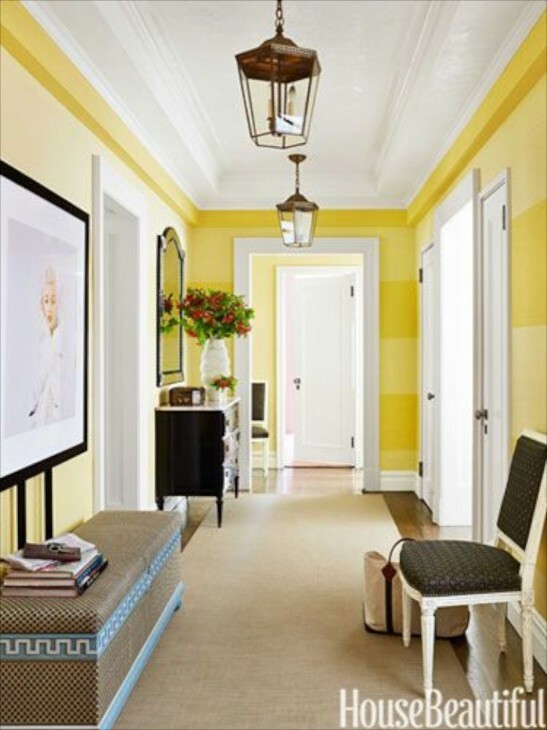 Yellow striped foyer. Marilyn Monroe watches over the hall from the wall and would approve. 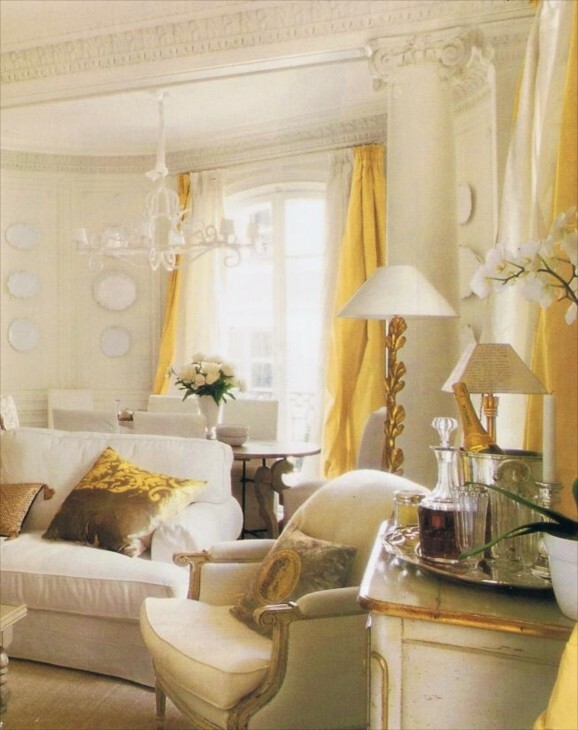 Soft, subdued yellow in a gorgeous room. The sisal rug keeps it from being too stuffy, while tying it to the art over the piano, and the black piano and black mantel are wonderful bold accent colors, adding just the right amount of contrast. Blue and yellow, probably the most common combination. 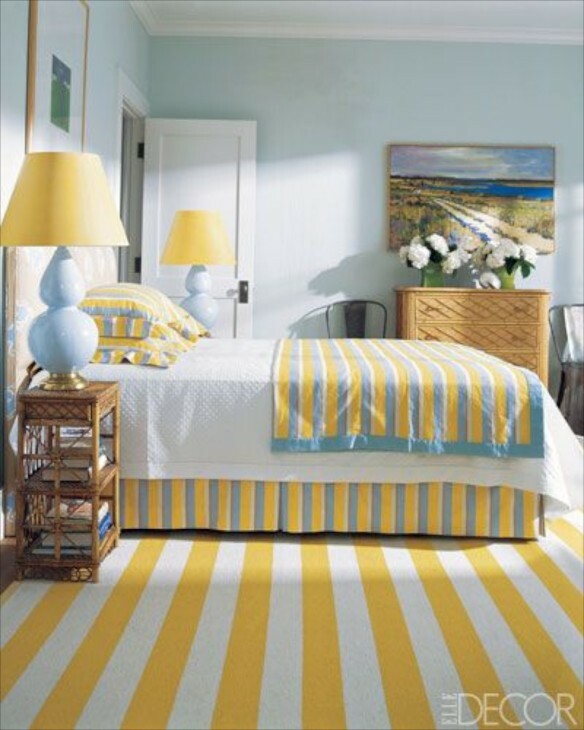 I love the yellow stripped rug. Bold yellow and red accents. The white trim work in this room is amazing. There is a lot going on in this wonderful eclectic dining room, and the four yellow chairs really lend a finishing touch. The saffron yellow drapes against a light lemony wall , sisal rug, and green plant, all seem to boldly say tropical and breezy in a cheerful yet sophisticated way. Stylish and chic. I can hardly imagine any other colored sofa in this room. Eclectic and beautifully curated. I love the carpet in this room. The bright white of the two chairs has almost as much impact as the yellow. Notice the bright red table over in the corner, which ties into the carpet. One would have to smile when first entering this room. Girly and fun. 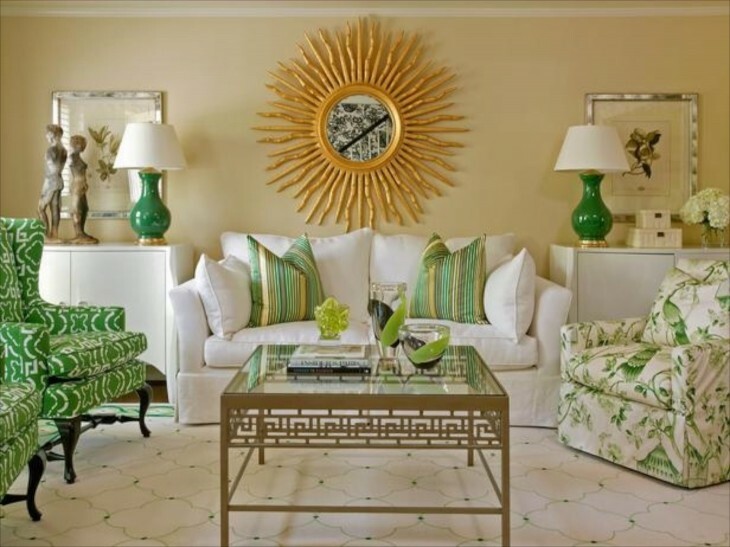 Yellow and green….which adds a welcome coolness to the warmth of yellow. Charming, gracious and refined. 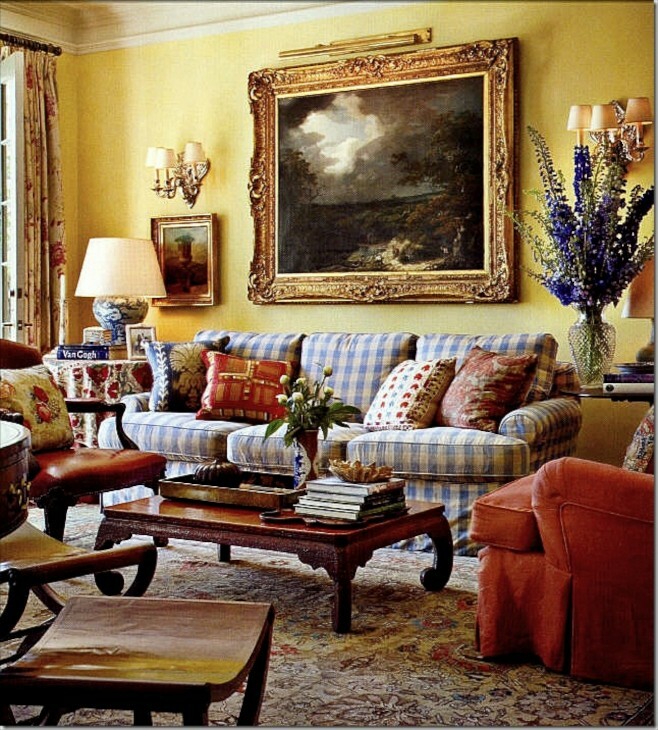 A comfortable retreat with red and blue complimenting the yellow. I like yellow best when there is a lot of light, natural light. Yellow seems to amplify the beautiful effect of natural light and vice versa. When trees are part of the equation, a room can have shadows and at times the feeling can be ethereal. I had a huge kitchen on the farm painted yellow. There were windows and french doors all around and so it already had so much gorgeous natural light. The yellow I chose really was perfect for that space. Friends and guest used to say to me “You know Charisse, I am not a fan of yellow, but this kitchen is beautiful and I might have to reconsider”. 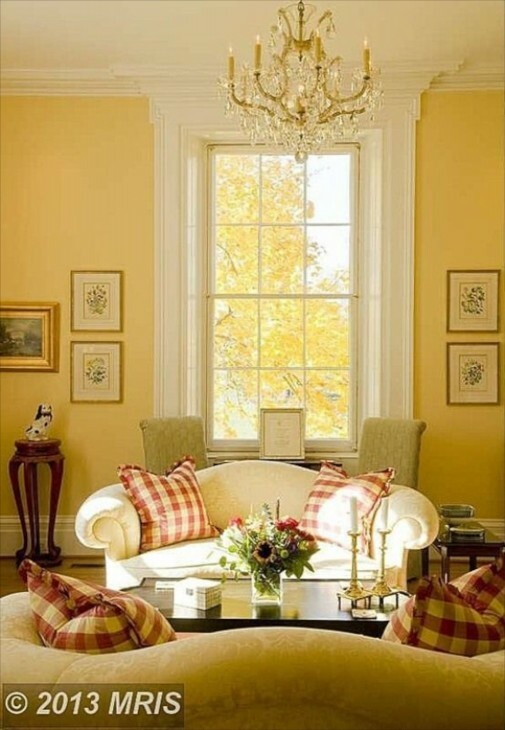 I loved that particular yellow color, but it would never have worked or looked the same in this house, or at least it would not have had the same warmth and impact. Yellow is like that……sometimes happy, warm and wonderfully inviting, and sometimes not at all. Bravo, Charisse! Both the words and subject are SO interesting…you can make anything come to life. Having made several ‘yellow paint’ mistakes in the past, I can appreciate the choices here. Thank you. Thanks Laurie. The yellow I had in my last house was so perfect. I miss it, but it just wasn’t right for this house. Happy weekend to you as well. I like yellow, and like it even more after seeing examples on your post. 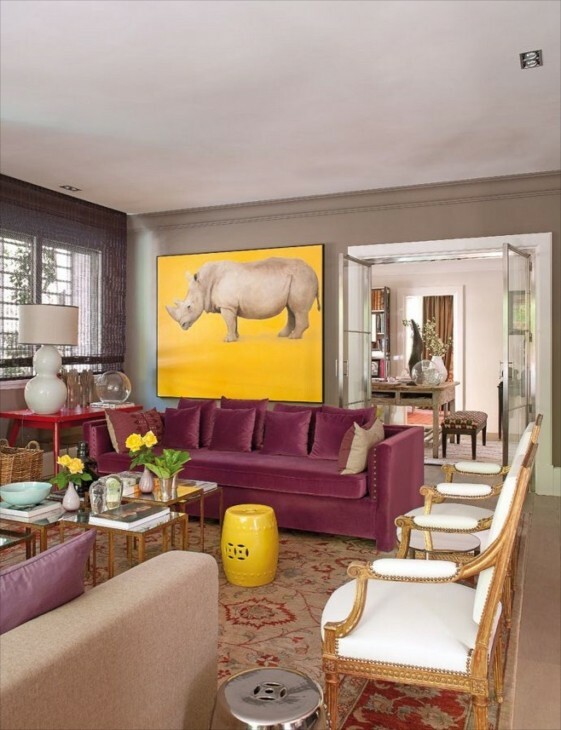 I loved the idea of the yellow room with green accent chairs, then all of a sudden red check pillows are thrown in to bring the look to another level. 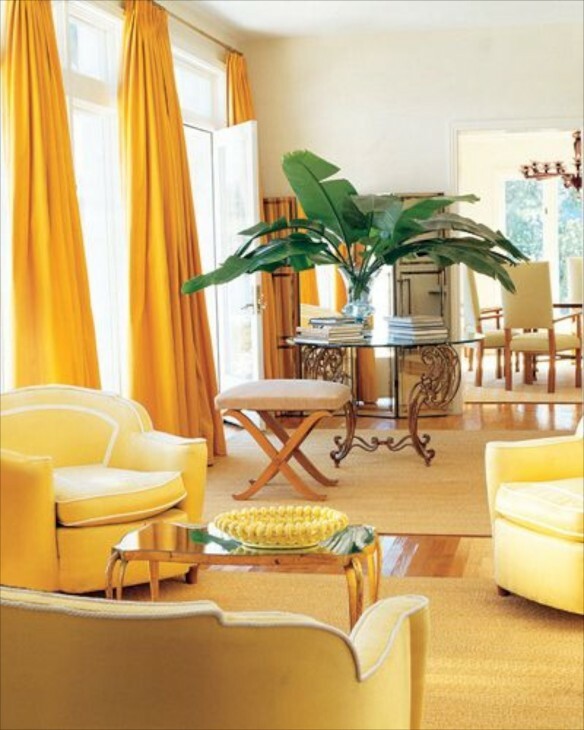 also love the all yellow with the saffron drapes, the green plant brings it all together for me. 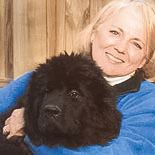 Maryanne, So glad to hear the post increased your fondness for yellow. Those saffron drapes were gorgeous weren’t they! There were elements in several of the rooms that I really liked a lot. 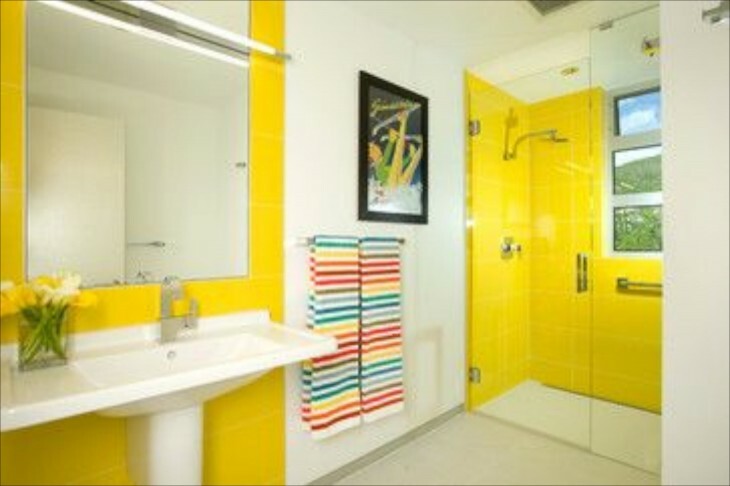 If I had to choose just one of these yellow rooms it would be difficult for me! Thanks for commenting. I love the first example. 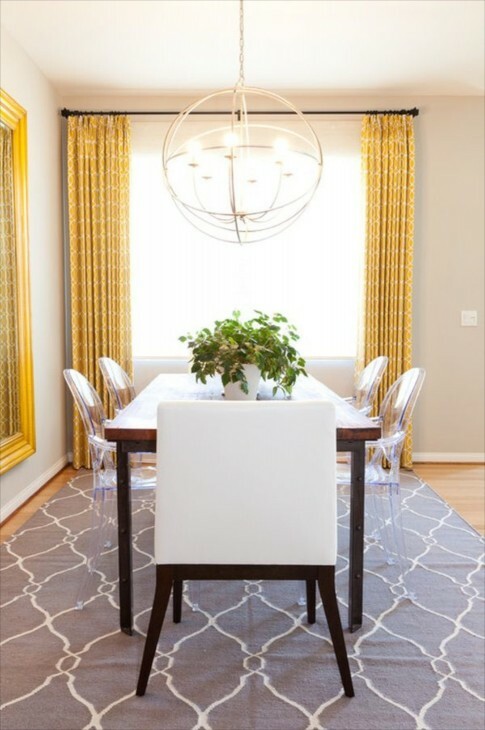 The dining room with the ghost chairs is neutral with the pale walls and grey carpet. 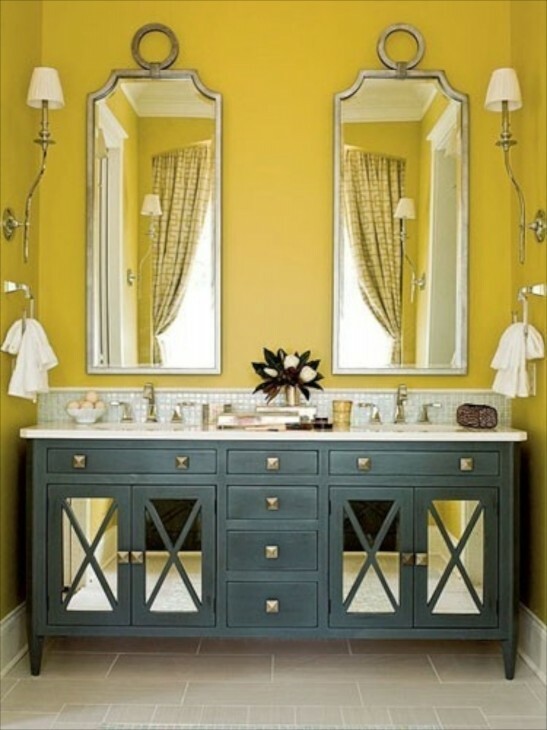 The yellow is a nice hit of color that is cheerful but not over the top. I like yellow in small doses in a room. I always wanted to buy a yellow trench coat in spring to brighten up those dark rainy days we get on the west coast but soon realized that the color was dreadful with my completion. So, I buy red and that perks me up. You made an important point here about undertone. So important when we decide on colors, for home and for ourselves. It is sunny and mild….a very nice change!